Blacktree Software has released Secrets 1.0.6, a Snow Leopard-compatible version of their preference pane which exposes hidden features on your Mac. If you've ever read a Mac tip that starts, "Open a Terminal window and type 'defaults write...'", it's highly likely that you can save yourself that effort with this preference pane. Secrets provides handy checkboxes to turn these features on and off, and doubles as a menu of secret settings. A "Top Secrets" entry shows a list of popular options, but many more options for various applications can be selected from the application sidebar. Clicking on any of the listed features will show you a short description of what it does in the bottom of the window; click on the More Info button for a detailed description. A few caveats before you go too nuts with the Secrets features: many of the features in Mac OS X that aren't official remain "secret" because they're not entirely debugged. You can expect to see some odd behaviors if you turn some of these on, so don't tick every checkbox at once; try out a change to see if you like it (and can live with any side effects) before you go on to something else. The Secrets preference pane requires System Preferences to run in 32-bit mode, and will prompt you to relaunch if, as per Snow Leopard default, it's in 64-bit mode when you launch it. If this is happening with several of your third-party preference panes, you can set System Preferences to stay in 32-bit mode by selecting the System Preferences.app in the Finder, choosing Get Info, and ticking the "Open in 32-bit mode" checkbox. All of your Apple 64-bit preference panes will work just fine. 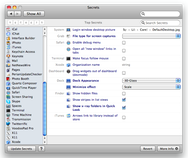 Secrets requires Mac OS X 10.5 or later and is a free download.